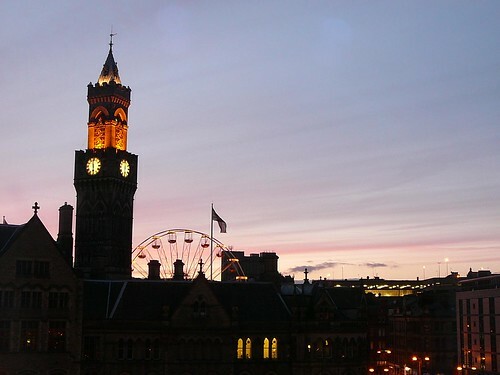 A Tower, a Sunset and a Ferris wheel. I’ve just got back from 2 days away on business, but where did I visit? So, like everyone else in the UK, we were woken around 1am this morning by the rumbling noise that soon became a full on shaking the house earthquake. “About a 3.5” I thought, as if I knew what I was talking about. Turns out it was just over a 5 on the Richter. “Yes it is, now go back to sleep” I replied. The thing is, although I was appearing calm and reassuring, my heart was actually racing. This is my second earthquake, the last one I felt was about 15 years ago, that shows how uncommom these medium size tremors are here in the UK. I couldn’t get back to sleep and I actually started composing this blog post in my head. It wasn’t like this though, it was much better, I’ve forgotten all the wonderful prose I imagined last night so this will have to do. This reminds me of a friend telling us about an earthquake he experienced while on holiday in the Caribbean. He was sitting on the bed when it began to shake. His first thought? The room was haunted! Thats right his first thought was the supernatural, more easily prepared to believe in ghosts than that the earth was shaking. Perhaps that says something about the British attitude to earthquakes, we dont have them so they are not actually real? 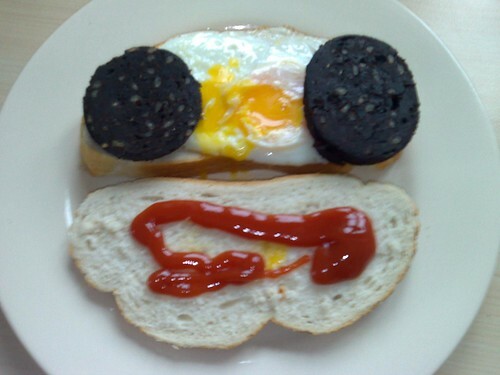 Just because its Sunday, I’m having breakfast a little late today, its a fried egg and fried black pudding sandwich on crusty bloomer bread with lashings of ketchup. Not everyones taste I suppose and not something I’d eat every day, but its delicious. I just noticed that I arranged this in the shape of a face, although the ketchup mouth looks like it has been punched! I arrived in work a few days ago and found this little lot on my desk. 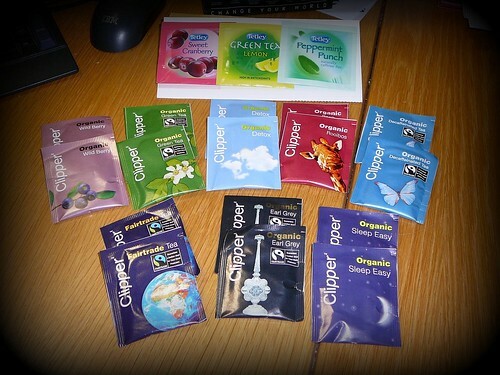 What a good friend I have, she had been given a fancy bag load of teabags at the freshers fair and hadnt been interested in them. I’ll mention no names, she knows who she is and I’ve already thanked her profusely. We heard a crash from the kitchen. We both ran in to find the plastic lid from the blender had fallen from the draining board. This is what we had heard clattering on the floor. Another soup of the day. Todays soup is a home made Lentil and Vegetable number which I knocked up yesterday. We had a Gammon joint for Sunday lunch, which Paul cooked in a large pan of water. Once the Gammon was removed I hit on the idea of using the water, now wonderfully flavoured by the Gammon, to make soup. 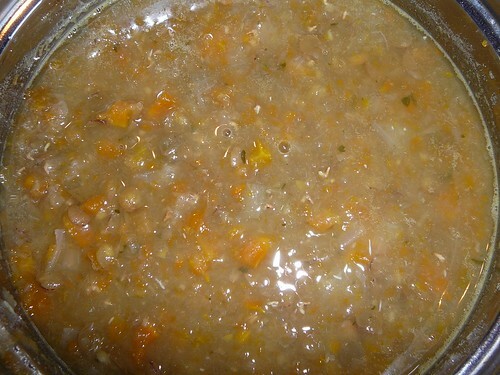 I strained the stock and added chopped Carrots, Swede and Onions and some washed Lentils. I added 3 cloves of garlic and a large teaspoon of dried parsley, it didnt need salt, the meat had taken care of that. That was it, total prep time around 10 minutes, I brought it to the boil then simmered it for 30 minutes. I didnt blend this one, I thought the texture was pretty good as it was. Its actually made 3 portions so there is some in the fridge to enjoy later this week. Is this becoming some Soup and Shoes blog?? What a bizzare combination of subjects, I must come up with something more interesting before you all fall asleep! I couldnt resist, I just had to have them, I know I only got new trainers at Christmas but still! 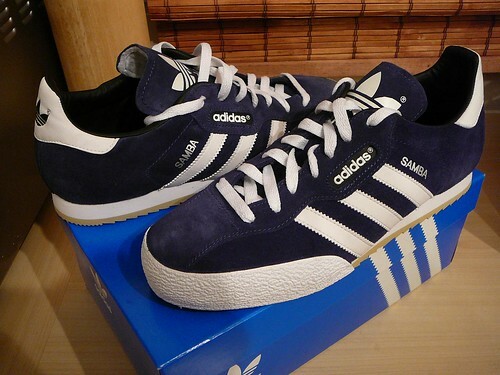 I love the Adidas Samba Super Suede and havent had a new pair for about about 2 years so I’m well due, the last pair have almost reached garden-wear status so its good to have a new pair to wear out. This is one of a line of top selling trainers reaching back decades, the original Samba originating sometime in the 1950’s. This version is my favourite, navy blue nubuck suede upper and a gum sole featuring the classic Samba suction cups. The over-long tongue, black-on-white Adidas motif on the rear and the distinctive 3 stripes all point towards this shoes venerable heritage. A good looking bumper bar wrapped around the front protects the toes from wear and tear and totally caps the whole thing off. You are currently browsing the Andy2boyz's Weblog blog archives for February, 2008.